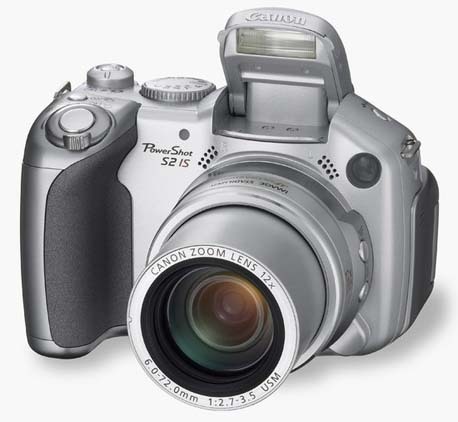 Canon PowerShot S3 is the successor to this with only few additions. So most of the features/issues over here also apply to S3. This page is dedicated to the Canon PowerShot S2 IS camera and contains tips, tricks, suggestions, strength, weakness and other related information about this excellent camera from the Canon camp. For a camera of 12X zoom it fits in a single hand and is quiet handy in that regard. Even though a 10X camera by Kodak using prism technology is available that is just the size of the standard pocket camera. But still for all other features and image quality this is far more superior for the size. Now chances of image getting spoiled due to hand shake is reduced by a margin, especially as high zoom levels where the shakes are also multiplied. Uses 4 standard AA battery. Now you have best of both the worlds. Get the best possible rechargeable battery and charger for the camera. And if nothing else you can always get this standard battery of any corner of any remote place if you are running low on it. For capturing fast action you have the maximum shutter speed of 1/3200 second. Use it for high speed sports or very bright light capturing. Just twist right and you are up and running for action. Twist left for viewing the captures. All common settings have dedicated buttons, without cluttering the camera with buttons. Menus are for less frequently used functions. Greatness lies in simplicity. Its not Made in China! If your image object is 100 pixels wide in no zoom shot, with full zoom of 12X it will be 1200pixels wide, with crystal clear resolution and details. Get the picture 12 times bigger, without compromising on the image quality. Press lightly and the zoom will glide slowly. Press it hard and it will zap to the zoom level. The motor emits ultrasonic sound that is inaudible to humans (but your dog will detect it!) while the camera is zoomed. It is for reducing the humming motor noise while zooming at the time of taking movies. So as Compared to these standards the S2 video is slightly lesser quality than the regular TV broadcast and DVD output, but is better than VCD and SVCD formats. You can zoom up and down while taking pictures. No more of shaky pictures that look amateurish. Meaning the image size will be 2592 x 1944 Pixels (5.04 Mega Pixels). The optimal recommended resolution (measured in pixels per inch, or ppi) for printing quality photos is 240 ppi. Minimum is 92 ppi, below which the printed image will be not at all nice. Creating panoramic image is very easy using this camera. There is a Panorama Assistance Mode in which you need to take overlapped snaps of your panorama. Then Auto Stitching Software on your computer will automatically create a panoramic image out of it. The software can also create Quick Time Panorama movie file. Camera can work in remote control mode from computer using the provided USB cable connection. Using USB cable extenders you can have your camera upto 45m (150ft) away from the computer and then remote control it. Can be useful in studios with limited mobility and quick processing requirement. Allows an adapter (sold separately) to be connected, eliminating battery need. Can be good for Studios, while connecting to the computer for long duration, or for watching long slide shows on your TV directly using the camera. A very big plus for this camera. All Axis Rotation is a bliss. Very convenient for taking snaps at any angle of your convenience. It can even rotate towards the subject making self timer shots much more convenient. I find it most useful for taking Macro snaps, Self Snaps and Timer Snaps. Supports 4GB SD card, as users have reported. Most reported working 4GB card is Transcend 4GB Secure Digital Card (TS4GSD150). Camera also supports Audio Only recording. Can come in handy at times. Taking movie on mountains or hills where high speed wind flows can introduce unnecessary noise in the recording. Use this feature while recording audio or movie at such times to have that noise filtered out. There are 5 levels of sensitivity that can be set for movie and sound recording. By default 3 is set. If you are to use level 4 and 5 then zooming can cause some unwanted noise in the recorded movie. Super Fine JPEG mode supported by this camera produces JPEG images almost as good as the RAW picture format (as reported in reviews). 3rd party attachment for this camera is available that will allow standard filters to be mounted and used by this camera. After attaching it you can use most of the standard filters available. This camera supports IR photography. Check out the snap of the TV remote's IR beam taken by this camera. USB 2 support for communication with the computer. This allows a reasonable speed for image transfers. For movies it may be slow as internal camera's SD card reading/writing speed is limited. If speed is a issue then using a high speed SD Card reader will be a better option than using the camera's USB port. You will also drain less battery that way! Allows customizable timer upto 30 seconds and upto 10 continuous shots with flash. Also you can set pre recorded sound while taking timer shots which will be played two seconds before the picture is taken. Now you camera can call out Say Cheese before firing the snap! Make sure to put the volume level at max. You can control the all the factors to get the desired image. One user assigned custom mode can be defined where you can specify all the parameters. Assign is to a shortcut button and its simply a button away! Use a standard PAL or NTSC TV and connect the supplied cable to its Audio/Video In. Now you can watch all the photographs and movies directly on the TV. Camera has a customizable Slide Show feature that can be used to show all or selected images Directly on the TV. Since this camera has inbuilt orientation detector it even rotates it correctly if the snap is taken vertically. So no more rotating of head to watch the snap! Its called the Super Macro mode. It allows your subject to be present at 0 cm from the lens of the camera. Happy photographing the Micro World around you. Just be careful not to touch your lens with the subject while taking the snap. Date battery is separate and so the camera will retain the Date, Owner Name and other Settings even if the main batteries are removed from the camera. For directly accessing the image to any PC application a TWAIN driver is provided that will let you specify the file a card from the file that will be imported by that application. Not in particular very useful, but may have use for specific applications. Fully supports Mac OS X as well as Windows. Same feature set is present for both Mac and PC bundled software. You can customize the following images and sounds in the camera. These are optional but can add fun to the photography. Orientation of the camera is detected and marked in the EXIF of the image file. Camera has setting for viewing that will auto rotate to the correct orientation for viewing purpose. While downloading to the computer it is upto the software setting whether to rotate it or not. Shoot and image, and then add comment to it. This is saved as a Sound Memo and is associated with the image. Now you know what to do with the guide's narration of the castle you plan to visit next. LCD monitor matches the brightness based on the current settings of Aperture, Shutter Speed etc. So that you approximately know how well the photo will come. The flash of Canon S2 is needed to be manually lifted in order to be used. This is at times used as a con in few reviews. But I think it is a very good feature. Since the display gives the warning about the flash so accidentally missing it is quiet low. The feature that I am talking about is the manual control of flash. When you dont want the flash to fire then just drop it down, camera will take that into consideration and change its internal parameters. So no extra button or menu item is needed for this operation. On a different note, the camera also supports the firing of the flash curtain. This control is from the menu and controls whether the flash fires at the time of opening of the shutter or at the close of the shutter. This can be used in night photography for some interesting results. Histogram of the taken image can be seen for judging the brightness or darkness of the image. Though the histogram is not available for the image not yet taken (this feature is added in S3), but you can view the histogram immediately after the snap is taken. A customizable delay is present that shows the taken snap for that duration. If you press DISPLAY button at that time then it will land into a view that will show the histogram and other parameters for the taken image. Also if you do not want to have that delay (as you cannot take another snap during that duration) then also you can view the taken snap by keeping the fire button depressed. Till the time you leave it the taken image is visible. While pressing this button you can also change the view by pressing the DISPLAY button. All the camera setting and information is stored in the EXIF part of the JPEG file. This can be accessed by the provided software, or any suitable software like IrfanView. See the table below to see all the information provided in the EXIF of the image. For some it may be devastating as they judge the camera from the brand of lens. But I think it should be judged from the quality of the final print/image. The image quality of S2 is good so I feel this is not a major issue. Photos with some contrast causes some fringing. Checkout the following photograph that I took of the overhead wire towards the sky. Notice the Red and Green fringing on the top and the bottom of the wire. This photo was taken on full zoom. Minor inconvenience, as you can take the snap and view it instantly and if needed correct it immediately by taking another snap. This camera is restricted to around 8 minutes of movie (using 640x480x30 fps) on one GB (Giga Bytes) of storage space. Also the maximum size of a single movie file on the card can not be more than 1 GB. So even if you have 2 GB SD Card, you cannot have more than 1 GB of continuous movie. But ofcourse you can have multiple movies of 1 GB each. So a 4 GB card should be able to contain around 30min of movie in atleast 4 parts - not that bad. Reason for 8 min/GB is the use of M-JPEG format for the movie. Motion JPEG (M-JPEG) is a video codec where each video field is separately compressed into a JPEG image. The resulting quality of intraframe video compression is independent from the motion in the image which differs from MPEG video where quality often decreases when footage contains lots of movement. In addition, it makes video editing easier, as cuts may begin on any frame, not only on the beginning of a group of frames. Another advantage is speed. With limited processing power on the camera MJPEG compression can be done faster. ISO 400 setting has a lot of noise and is practically of not much use. 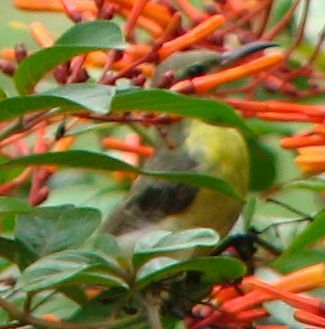 At 5MP image (Large Size) setting, even with full Optical Zoom the LCD (115,000 pixels) is not able to detect small objects, like birds. If you happen to take pictures of them in leafy background it would be very difficult to actually spot it on the LCD. Here digital zoom can come in handy, but there is no way to stay in digital zoom and take snap in optical zoom only. I wish that would have been a feature of the camera. 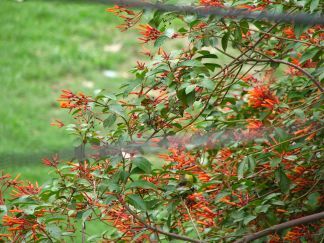 Try to find the bird in the right image, in the LCD equivalent image on the left! I cannot directly record the movie on the computer but I can take still images. Even though while taking the still image from the computer a streamed video is available in the software, they have not provided any control to record that stream as a movie. So I cannot connect it and use as a high tech Web Cam! Faster focusing speed would have been nicer, though the current speed is not that bad. A body-hugging camera carry bag would have been a nice to have. Otherwise current bags make the carrying size of the camera on the bigger size. In many reviews I have seen comments about the loose lens cap. I think it is also for a purpose. On switching the camera in shooting mode the lens comes out of the hood. And this also means if the lens cap was on then it has to open that also. So a loose cap is good so that it will not come in the way of the lens which could have otherwise caused problem. Also since the cap is internally coated with fibrous material I think it is not that easy to fall off on its own. That has not occurred to me at least till now.